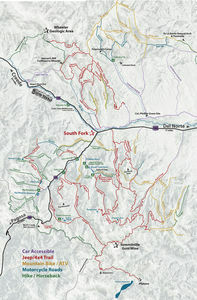 In December of 2015, South Fork was named the first designated Continental Divide Trail Gateway Community in Colorado. 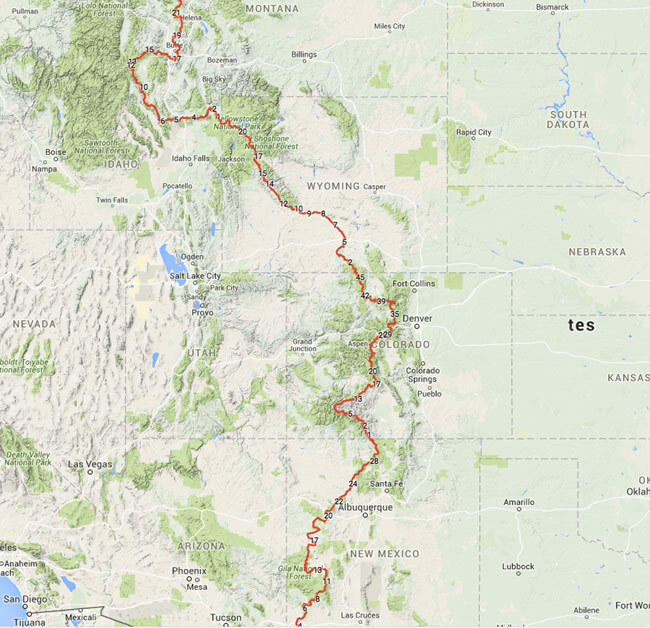 The Continental Divide Trail Coalition seeks to benefit communities along the Continental Divide National Scenic Trail (CDT). 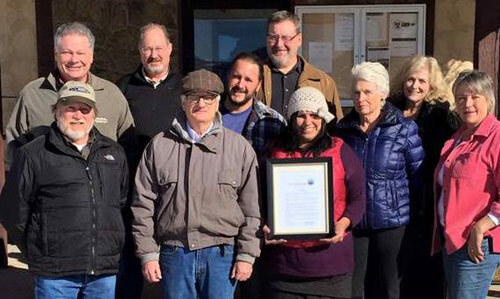 Launched in 2013, this program recognized communities for their part in promoting awareness of the CDT as an important national and local resource. Established by Congress, in 1978, the CDT is one of the most significant trail systems in the world. Considered one of the greatest long-distance trails in the world, it is the highest, most challenging, and most remote of our National Scenic Trails. The CDT passes over US Highway 160, approximately 17 miles west of South Fork, at the top of Wolf Creek Pass, as part of the 3100 miles it traverses from Mexico to Canada. Long distance hikers and day hikers use South Fork as a base or a stopping off point during the most beautiful section of the hike, the majestic San Juan Mountains. South Fork is the only Gateway Community to provide bicycles to hikers, generously donated by the Greater South Fork Community Foundation. 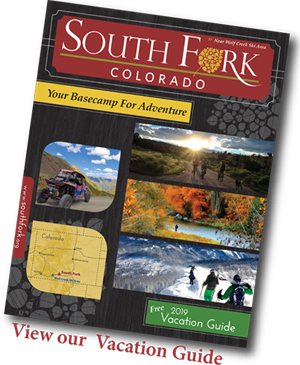 In 2015, 2016 and 2017, South Fork hosted Warrior Expedition Hikers, with lodging and meals provided by various merchants. If you would like to help with keeping the CDT the treasure it is, volunteers will be working on trail stabilization and improvements in the summertime. Volunteers are needed and can get more information at 303.996.2759. 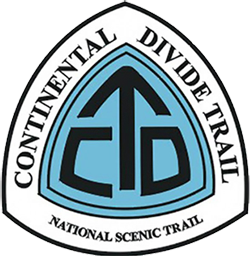 To find out more about the CDT, visit www.continentaldividetrail.org. 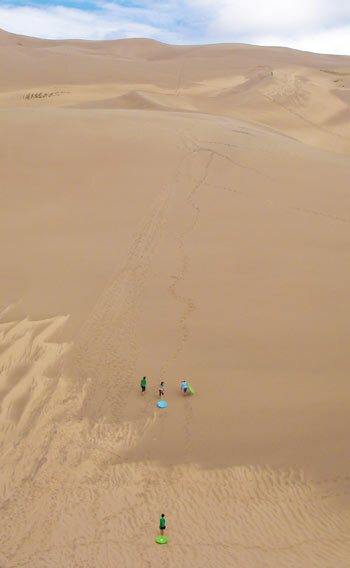 There are miles and miles of trails that offer fun and adventure for the whole family. From 1/2-mile walks for the novice hiker to 5-mile treks that lead to other trails that go on and on into the wilderness… you will not only get a great workout, but will encounter spectacular mountain scenery and a variety of wildlife! As you prepare for your venture into the woods it is suggested that if you plan to travel more than 30 minutes from your car that you carry a day pack. This should include water, food, rain gear, and a sweater. Remember when hiking in the mountains that weather conditions are rapidly changing, and you should be prepared for anything, so not to get surprised, and possibly lost in any inclement weather. Start at Big Meadows Lake and you can either walk around it or at the upper end of the lake take the Archuleta Lake trail. Difficulty: Moderate - due to eleveation gain of mearly 3,000 ft. The trail will be found at the end of Bever Creek Reservoir, on the left side maked "The Fir". Trailhead past Big Meadows 11 miles. Trail begins at Wilderness boundary, you may continue around the lake to the Highland or Tie Hill trails. From Beaver Creek Road drive about 5 miles to access parking lot. Road #380 until you see the Crater Lake trail marker. 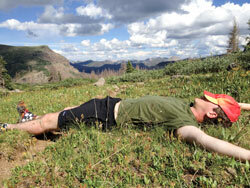 Difficulty: Strenuous due to elevation gain of 2,000 ft. Follow Big Meadows to dead-end, trail starts on left side of turn around. Follow Big Meadows (Archuleta trail to intersection with trail 750 turn left to 710 intersection. Grab breakfast in town before heading east towards the San Luis Valley. To take the “scenic route” east, turn off at the Ute Bluff Lodge onto CR 19, cross the mighty Rio Grande and follow the paved/dirt CR 15 as it snakes along the river, through scenic ranches and farmland for about fifteen miles. Consider a detour at the sign for Colonel Pfeiffer’s Grave, and visit the land granted to him by the Native Utes. Pass by Indian Head and other unusual and remarkable mountain outcroppings. Zigzag south-east-north just before getting onto Colorado 112 and travel north along the outer edge of the Valley for just over 2 miles. Follow the signs for Penitente Canyon and La Garita, and turn onto CR33/38A. You will first take an 11 mile round-trip expedition to see the Arch, or La Ventana (spanish for “window”), one of southern Colorado’s most unusual natural formations. Note the interesting geology of the area: about 33 million years ago during a period of explosive volcanic activity, large amounts of volcanic debris and ash were ejected into the air. Heat and pressure formed the ash into very hard rock, and millions of years worth of erosion deteriorated the softer material, leaving behind what we see today! The Arch was carved out of a volcanic “dike” and you might notice the signs of weathering on nearby companion arches. To see the Natural Arch: Take a left off of Rd 33/38A onto FS 660/Rd A32. Follow this road for 4.1 miles. Take FS 659/ Rd 35C and go another 1.6 miles north. South Fork to the Natural Arch: aprox 1 hr drive. Return to Road 38A and continue north-bound. 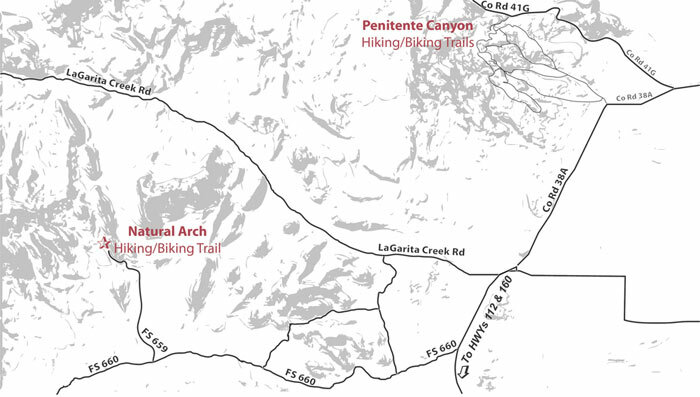 Next up is Penitente Canyon, a designated Special Recreation Area with something for everyone! For the sight-seer, hiker and history buff: Take the short hike up to see the Wagon Wheel ruts, a part of the Old Spanish Trail that served as a pack-animal route for traders traveling west to California in the mid-1800s. Wander throughout the unusual canyons in search of the San Luis Valley’s largest collection of pictographs. 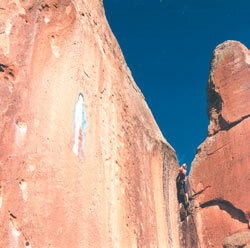 Most is the work of indigenous peoples who lived in the area 2,000 years ago, but a newer example is the faded blue Madonna high up on a rock face, reportedly painted by locals in the mid 1900s. For the rock climber: Penitente Canyon is an internationally recognized climbing area, providing 60-70 incredible sport climbing routes. The unusual volcanic landscape (rock that eroded and cracked over time) not only created a mystical backdrop for recreation, but the smoothed and rounded rock-face provides good hand-holds! 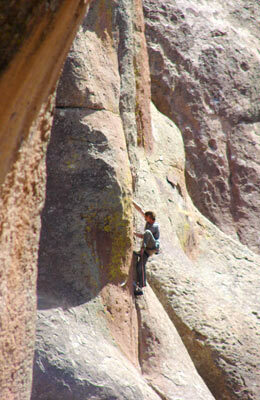 South facing routes can be climbed year-round and range from beginner to advanced levels. For the mountain biker: 2 mountain bike loops offer a great opportunity to see the area. The B-loop is best for the beginner, while the A-loop is more fun for an advanced rider. Each route is less than three miles, and can also be hiked. If you need a snack break, return to CR 38A and drive the short distance to the town of La Garita. Stop at the Cash Store, an old log cabin turned general shop. Visit the picturesque 1924 Catholic church that today houses the San Juan Art Center. 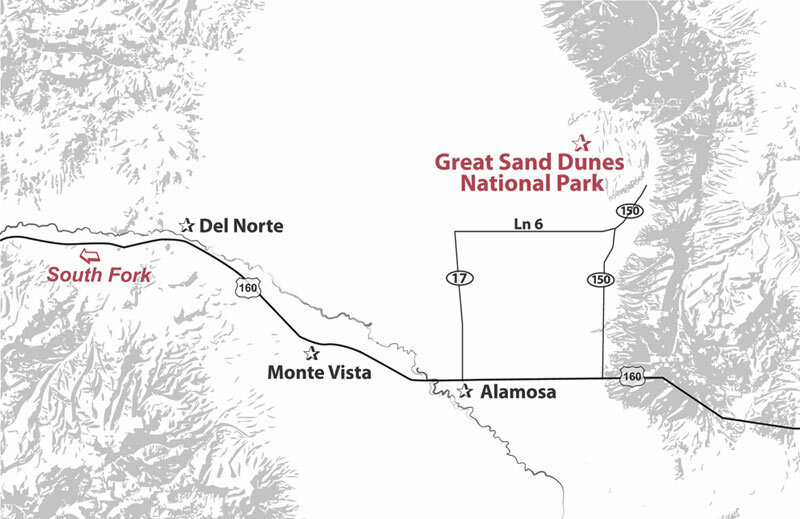 Make your return trip via Del Norte. Consider a stop by the Rio Grande County Museum for more about the local heritage and make a note to ask about Colonel Pfeiffer, a well know and respected Indian Agent! Wander Grand Avenue’s antique shops and art galleries, and have dinner at the Historic Windsor Hotel. 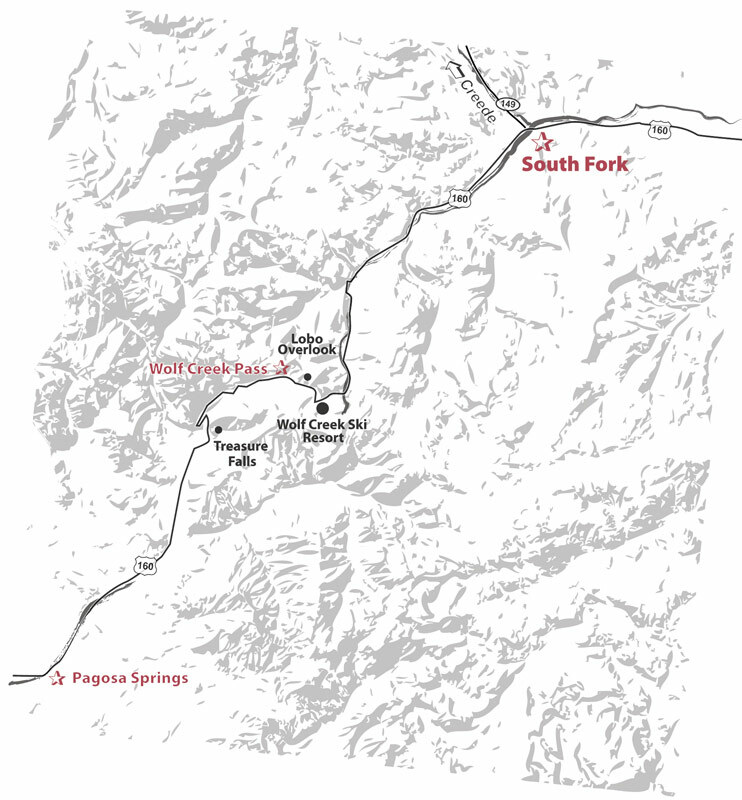 Head out of South Fork on Highway 160, tuning your iPod to CW McCall’s humorous song “Wolf Creek Pass,” in which an out of control truck driver attempts to navigate the steep and winding road. When you reach the summit, just past the Wolf Creek Ski area, you will be on top of the Continental Divide. For a view from the top-of-the-top, take a side tour to the Lobo Overlook (Exit the highway to the right, just before you reach the large pull off/parking area onto County Rd 402. Note this road is occasionally closed to all but hikers and bikers). 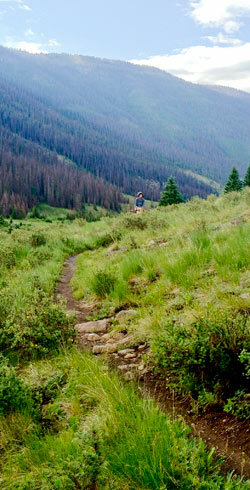 A steep 5.1 miles gets you high atop Thunder Mountain and provides stunning vistas of the surrounding San Juans. To the south you see Treasure Mountain, an area rich in folklore and stories of buried treasure. One legend suggests a chest of gold was buried on the mountain by soon-to-be-captured Frenchmen running from either Spaniards or Native Utes. 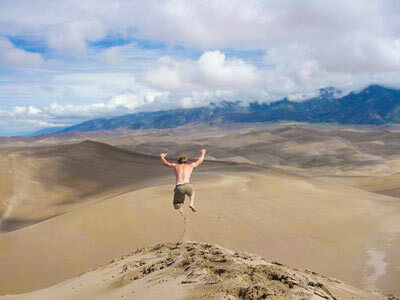 If you are feeling extra ambitious, a hike around the area might result in a huge payout! To the far southeast is the Summitville mining district (another great day trip, though 4x4 is required). To the northwest lies the Weminuche Wilderness, the largest wilderness area in Colorado. Notice the windswept conditions of the trees living at “timberline,” and hunt for a few alpine wildflowers! Return to the highway and prepare yourself for a dramatic experience, despite the major US Highway you are traveling on. Wintertime brings this area the MOST snow in Colorado, so roads are often snow-packed and icy in the winter months. Even summertime sees the occasional snow! As you descend into the valley, stop at the scenic overlook just before the hairpin turns. A spectacular view of the Left Fork of the San Juan River will inspire you to pull out a camera (or iPhone)! A couple of switchbacks later, and you will want to pull over again. Treasure Falls is a beautiful cascade that runs nearly all year, dropping grandly across the face of a rough volcanic cliff. A large parking area marks the entrance to the hiking path that leads to the base of the falls. The path is about 1/4 mile, well maintained, and suitable for all ages! The remaining drive into Pagosa Springs is easy and pleasant, leading you through a scenic valley of large ranches and farmland. 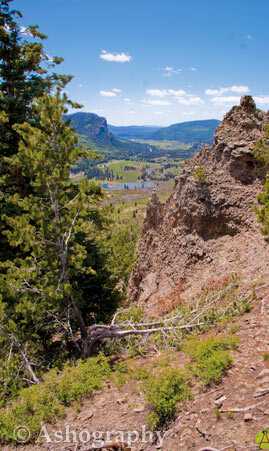 Pagosa Springs is known for its year-round arts and music festivals. A lively downtown offers several great dining choices and lots of shopping! 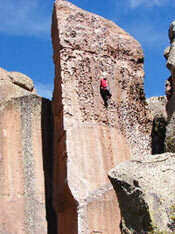 Check visitpagosasprings.com to see their summer, fall and winter guides. Your final, and ultimate destination will be the Springs Resort. 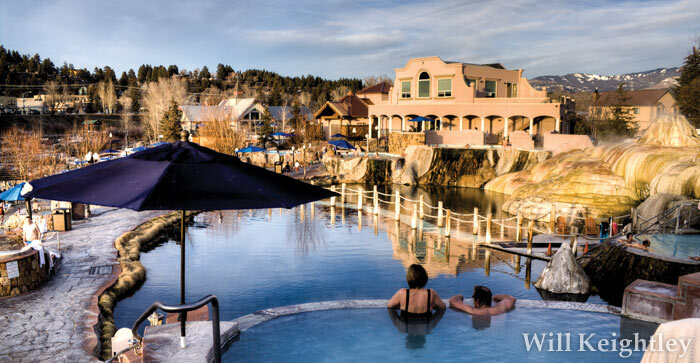 With 23 hot tubs filled with natural hot springs mineral water, you will find relaxation and adventure as you travel from tub-to-tub, finding your perfect temperature, mountain view, or proximity to the San Juan River. Bring the whole family, as a full-size pool, mild-temperature tubs, and river-access provide endless hours of fun for the kids, too! -- Approximately 43 miles from South Fork. 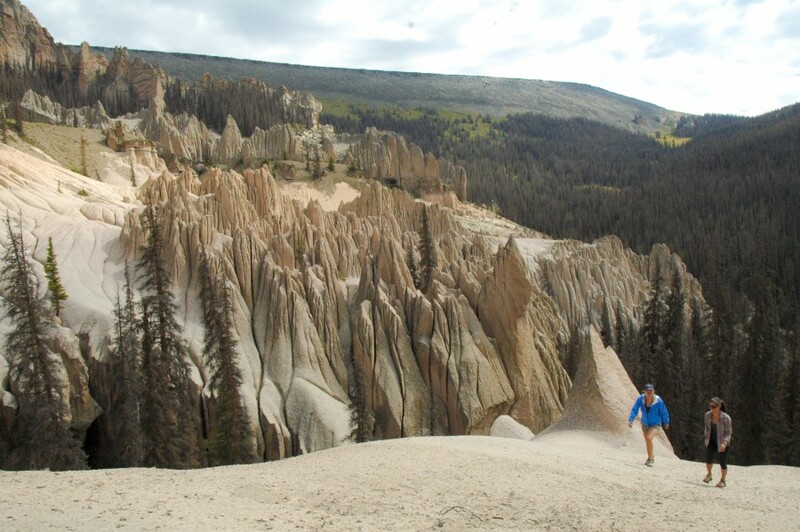 The Wheeler Geologic Area is one of the most fascinating geological features in the San Juan Mountains, located 2- miles east of Creede on the south side of the San Luis Peaks, or 24 miles from South Fork on Pool Table road. 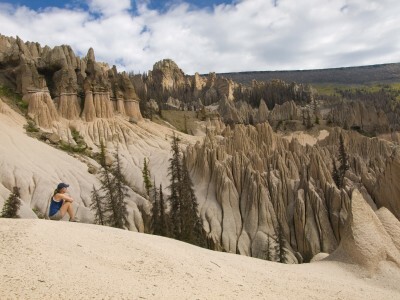 The geologic formations are contained in a tiny 60-acre section of the Rio Grande National Forest. In this area a mound of volcanic ash has eroded into a landscape that is so bizarre it seems to belong on another planet. 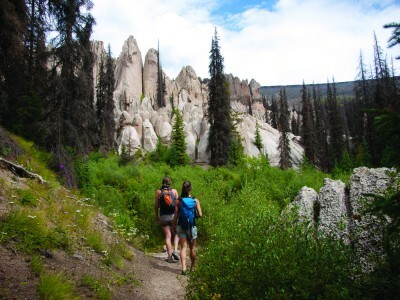 Wheeler Geologic Area resembles a mysterious ghost city, with spires and minarets that seem to float like a cloud above the surrounding mountains and evergreens of the national forest. This unique geologic phenomenon originated as part of the violent volcanic history of the San Juan Mountains and millions of years of erosion by the elements that carved the eerie landscape that we see today. The San Juan Mountains are the largest volcanic area in Colorado. Enormous lava flows from volcanoes that existed 40 million to 30 million years ago coalesced into a composite volcanic field that was up to 4,000 feet thick and covered about 9,000 square miles. After a quiet period that lasted about a million years, the character of the volcanic activity underwent a dramatic change. About 20 million years ago great pyroclastic eruptions began to produce large quantities of volcanic ash. With major ash flow eruptions exploding again and again from 18 different volcanoes, building up a layer of volcanic ash that was up to 3,000 feet thick in some areas. Most of these pyroclastic eruptions ended about 26.5 million years ago. Sporadic volcanic activity continued until about five million years ago. 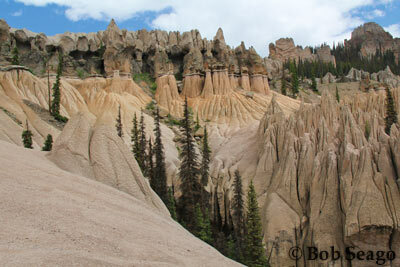 The Wheeler Geologic formations are a product of the period of ash flow eruptions. The debris was blown into the air during a pyroclastic eruption consisting of individual particles that range in size from dust flakes to a few scattered pebbles rarely more than a few inches in diameter. Occasionally broken rock fragments up to two or three feet in diameter, called brecci, were thrown out with the ash cloud. The ash particles settled back on to the groun din layers called volcanic tuff. Tuff particles are not firmly cemented together, so the relatively soft tuff beds are readily eroded by the wind and rain over millions of years. Most tuff is light gray or creamy in color, with a bit of pink and sometimes brown thrown in for good measure. In the Wheeler area, the rains have carried away much of the smaller particles. Although a large rock will protect the tuff underneath it with the surrounding ash eroded away. Resulting in a tall spire with a large rock balanced on the top as if a race of giants had sculpted the pinnacles and then balanced a rock on top of their sculpture. During cooling, the beds of ash often developed numerous vertical cracks. Erosion slowly widens these cracks, producing rows of ash columns that look like a parade of pale soldiers or huge ghosts. Some areas of ash are more solidly compacted than others, resulting in different rates of erosion that have produced many of the more peculiar shapes. Those who have written about the area describe the panorama of spires and pinnacles as forming castles, cathedrals and mosques. 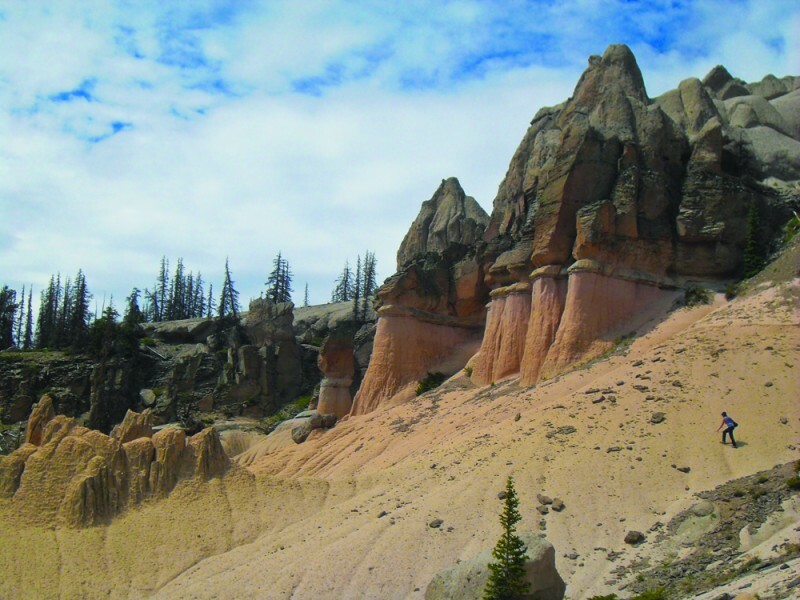 The first recorded visit to the Wheeler formations was in 1907 when Frank Spencer, a Forest Service supervisor, and Elwood Bergy, a resort owner from Wagon Wheel Gap, followed up on rumors and located the place. Their enthusiastic report owner from Wagon Wheel Gap followed up on rumors and located the place. 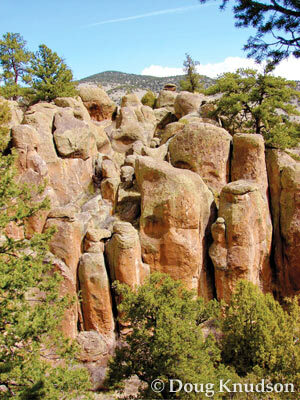 Their enthusiastic report resulted in the designation of 300 acres around the area as the Wheeler National Monument. President Theodore Roosevelt signed the proclamation creating the monument, in December 1908. The name of the monument honors George M. Wheeler of the U.S. Army Corp of Topographical Engineers, who did extensive geological surveys in the area from 1873 to 1884. Although he got close to the area, there is no recorded that Wheeler actually observed the formations. The Forest Service managed to monument until 1933, at which time jurisdiction was transferred to the National Park Service. However, because of its remote location and a lack of money there was no development of the site. In 1943 there were only 43 recorded visitors. On August 3, 1950 the Wheeler National Monument was abolished and the area once again became part of the Rio Grande national Forest. The Forest Service was sensitive to the need to protect this fragile area. In 1962 the protected area was increased from 300 to 640 acres and all mineral prospecting was prohibited. In 1969 the improved gravel road that reached to within 14 miles of the area was constructed, but plans to continue the road to the actual geological formation were cancelled. It was in 1969 that the title Wheeler Geologic Area was applied to the protected 640 acre site. 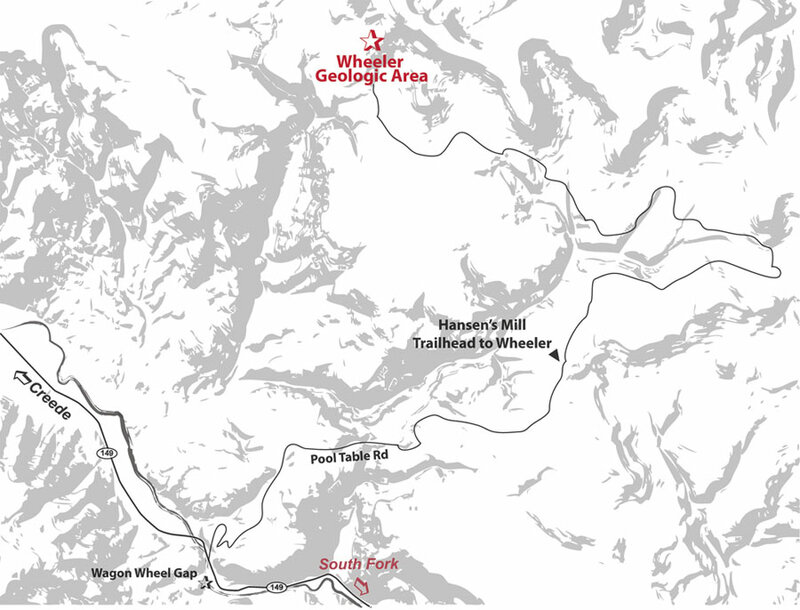 The status of the Wheeler Geologic Area remained unchanged until 1993. On August 13 of that year the Colorado WildernessBill of 1993 was signed, placing a total of 611,730 acres in Colorado under tightly controlled wilderness management. One of the designated wilderness areas includes the Wheeler Geologic Area; comprising 25,640 acres in Mineral and Saguache counties. Wilderness designation precludes any logging, mineral exploration, road building, new water diversion structures or mechanized travel. Under the terms of the 1993 Wilderness Bill, the Wheeler Geologic Area will receive full wilderness protection. The area is a wonderful place to see, but getting there requires a good bit of effort. The 14 mile, 4-wheel drive road to the area is quite rough and in wet weather it can get very slick and become impassable. Potential travelers are advised to check with the Creede Ranger District Office prior to making the trip. A visit to the Wheeler Geologic Area begins on Pool Table Road, which is a good gravel road that climbs to an elevation of 10,840 feet in about ten miles and ends at the site of the old sawmill referred to as Hanson’s Mill. Car travel ends at Hanson’s Mill, where the only remnants of the old sawmill is a huge pile of sawdust that continues to smolder with a deep fire that never goes out. The only amenities offered at this area are room for primitive camping and restroom facilities. From Hanson’s Mill, the 4-wheel drive road is well marked, and designated as Forest Service Road 600. The road is a narrow corridor that is surrounded by the newly created wilderness area. The left fork can be driven for about a mile until the road ends and the 5.7 mile hiking and horse trail begins (Trail No. 790). The 4-wheel drive route goes straight ahead at the fork, beginning the start of a long and bumpy 14 miles to Wheeler. The road is relatively flat, as the Wheeler site is only 300 feet higher than Hanson’s Mill. However, deep ruts and an unending succession of big rocks keep progress to a crawl. The 14 mile trip will often require more than three hours. The scenery along the route is so beautiful that stops for pictures and looking always slow progress. A variety of wildlife is common with deer, elk and coyotes rewarding those who keep a sharp eye on the surrounding forest. The last mile of the road winds through dense stands of fir and spruce, with deep ruts and narrow spaces between trees requiring some driving skills, when wet, this section of road becomes so slick that not even 4-wheel drive provides much control. The road ends about a half-mile from the formations, where there are several nice spots to camp or have a picnic. A well-defined foot trail leads to the geologic area. After 200 yards, the trail divides; straight ahead leads to the base of the scenic area and a small rough shelter that was built around 1915. The left fork climbs around the west side of the formations to a spectacular scenic overlook that provides a panorama of the entire area. A small bench has been erected near the overlook. Visitors will need to be careful at the overlook and everywhere else you walk on the volcanic tuff. Erosion has formed canyons with steep walls. Many small round pebbles lie about the ash fields, resultin gin tteacherous footing much like walking on a floor covered with marbles. A trip to the Wheeler Geologic area requires a long day plus strong legs, a horse or 4-wheel drive vehicle.